This Tom Ford dress is not an easy look to pull off. With a dress this “simple” the tailoring has to be impeccable and the accessories must be on point. That cuff! There are no bells and whistles to distract the eye. It’s a formal gown, yet the dress looks comfortable. The cape was a daring and practical choice. It was chilly that day in Los Angeles. Gwyneth was mentioned on many Oscar Best Dressed lists and I agree. She said in several interviews that this was the only dress she tried on. 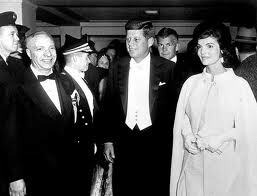 Gwyneth was inspired by Jacqueline Kennedy’s 1961 Inaugural gown which was made by Bergdorf Goodman’s Ethel Frankau. Thanks for the reference- I love both dresses, and also the idea of knowing what is right immediately. I agree. Sometimes it’s good to go with your gut. Previous Previous post: What Is Stylish Simplicity?